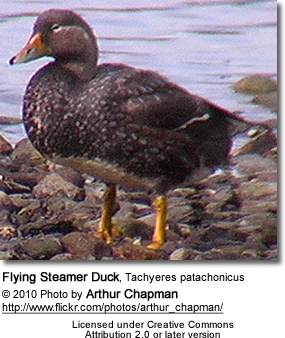 Tachyeres (Steamer Ducks) is a genus of ducks in the bird family Anatidae. All of the four species occur in South America, and all except T. patachonicus are flightless; even this one species capable of flight rarely takes to the air. The genus name Tachyeres, "having fast oars" or "fast rower", comes from Ancient Greek ταχυ- "fast" + ἐρέσσω "I row (as with oars)". 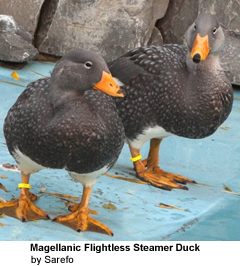 The common name "steamer ducks" derives because, when swimming fast, they flap their wings into the water as well as using their feet, creating an effect like a paddle steamer. 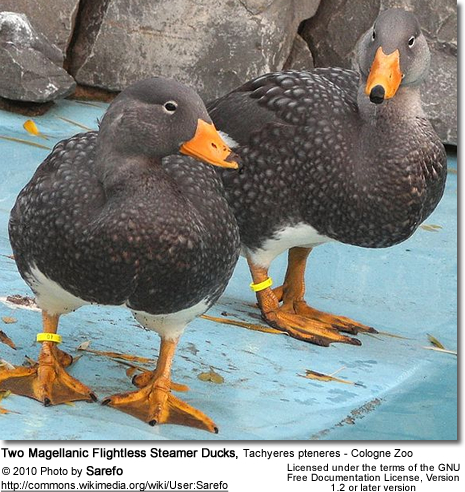 They are usually placed in the shelduck subfamily Tadorninae. 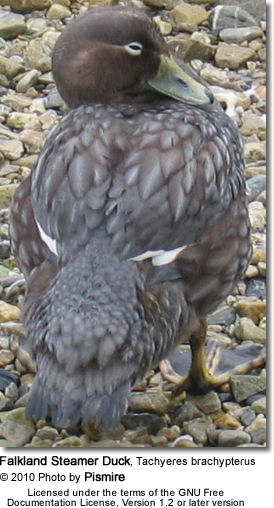 However, mtDNA sequence analyses of the cytochrome b and NADH dehydrogenase subunit 2 genes (Johnson and Sorenson, 1999) indicate that Tachyeres rather belongs into a distinct clade of aberrant South American dabbling ducks, which also includes the Brazilian, the Crested, and the Bronze-winged Ducks. White-headed Flightless Steamer Duck Tachyeres leucocephalus - The White-headed Flightless Steamer Duck was only described in 1981.